In 1988, the defending National League champion Cardinals staggered into the all-star break after experiencing a humiliating loss during a series that exposed multiple flaws and severely tested their resolve. The 1988 Cardinals ended their first half of the season with three games at San Francisco. Mike LaCoss pitched a four-hitter in the opener and the Giants won, 1-0. Terry Mulholland pitched a five-hitter in the finale and the Giants won, 2-1. It was the middle game of the set that sent the Cardinals reeling. The Giants beat them, 21-2, on Saturday afternoon, July 9, 1988, at Candlestick Park. The 21 runs also were the most scored by the Giants since they moved to San Francisco from New York in 1958. The previous high was 19. Two unlikely Giants standouts in the blowout win were infielders Chris Speier and Ernest Riles. Speier, 38, filling in at second base for ailing all-star Robby Thompson, hit for the cycle and had five RBI. He had two doubles, a triple, a home run and a single. It was the only five-hit game in Speier’s 19-year major-league career. The oldest big-league player to hit for the cycle was Cy Williams, 39, of the 1927 Phillies, the Post-Dispatch reported. Like Speier, Honus Wagner of the 1912 Pirates was 38 when he hit for the cycle. Riles had been acquired by the Giants a month earlier in a trade that sent outfielder Jeffrey Leonard to the Brewers. Riles, who entered the game in the sixth inning as a replacement for shortstop Jose Uribe, hit a three-run home run in the seventh. 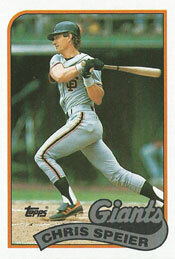 It was the 10,000th home run in Giants history and the first for Riles as a Giant. The ball hit off the facing of the upper deck and caromed back onto the field. Disgusted, Cardinals right fielder Tom Brunansky picked up the historic ball and heaved into the stands. After the game, Brunansky sought a closed-door meeting with Cardinals manager Whitey Herzog. Cardinals starting pitcher John Tudor entered the game with a 1.72 ERA. The Giants knocked him out of the game with five runs in two innings. Relievers Bob Forsch and Steve Peters each gave up eight runs. The Giants ended up with 20 hits and six walks. Thanks for sharing your experience. Not many get to see a team score 21 runs in a game!